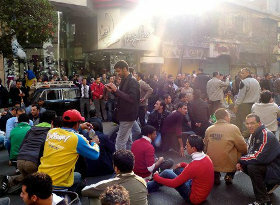 In Egypt there are riots, civil war in the capitals and the Western countries find a common position. Some, like UN Secretary General Ban Ki Moon calling for free elections immediately, while Italian Prime Minister Silvio Berlusconi Mubarak strengthens the back. Maybe that’s a good thing, because ultimately must decide the Egyptian people, how to proceed there. In my eyes this Mohamed ElBaradei only one who now wants to jump on the moving train to dust at times quickly president. He is in my eyes is not democratic legitimacy. Find ich gut. Die Sache mit den intakt bleiben müssenden Logos sehe ich allerdings etwas problematisch, weil dadurch z.B. Ausschnittsvergrößerungen erschwert werden.